Kerrville is a city in Kerr County, Texas, United States. Kick off your visit on the 3rd (Fri): Head underground at Cave Without a Name, then learn about winemaking at Sister Creek Vineyards, and then sample the fine beverages at Hill Country Distillers. Keep things going the next day: get a new perspective on nature at Riverside Nature Center, then admire the masterpieces at The Museum of Western Art, then catch a live performance at Hill Country Arts Foundation, and finally do a tasting at Kerrville Hills Winery. To see ratings, more things to do, photos, and more tourist information, you can read our Kerrville road trip planning app . San Antonio to Kerrville is an approximately 1.5-hour car ride. In May, Kerrville is little chillier than San Antonio - with highs of 82°F and lows of 60°F. Wrap up your sightseeing on the 4th (Sat) to allow time to travel to Marfa. Marfa is a city in the high desert of the Trans-Pecos in far West Texas, located between the Davis Mountains and Big Bend National Park. On the 5th (Sun), explore and take pictures at Fort Davis National Historic Site, then look and learn at McDonald Observatory, and then admire the majestic nature at Davis Mountains State Park. Keep things going the next day: see the interesting displays at Marfa and Presidio County Museum, then admire the striking features of Presidio County Courthouse, then stop by Davis Mt. Broom Shop, and finally look for all kinds of wild species at Chihuahuan Desert Nature Center & Botanical Garden. To find other places to visit, maps, reviews, and tourist information, use the Marfa vacation planning site . Traveling by car from Kerrville to Marfa takes 5 hours. Alternatively, you can fly. Traveling from Kerrville in May, plan for slightly colder nights in Marfa, with lows around 48°F. Finish your sightseeing early on the 6th (Mon) so you can travel to Las Cruces. Las Cruces, also known as "The City of the Crosses", is the seat of Doña Ana County, New Mexico, United States. On the 7th (Tue), learn more about the world around you at Museum of Nature & Science, examine the collection at The Zuhl Museum, then get engrossed in the history at New Mexico Farm and Ranch Heritage Museum, and finally steep yourself in history at Old Mesilla Village. To find traveler tips, more things to do, where to stay, and other tourist information, you can read our Las Cruces tour itinerary maker site . You can drive from Marfa to Las Cruces in 4 hours. Another option is to fly. Traveling from Marfa to Las Cruces, you'll gain 1 hour due to the time zone difference. In May, daytime highs in Las Cruces are 83°F, while nighttime lows are 53°F. Finish up your sightseeing early on the 7th (Tue) so you can travel to Moab. Take a break from the city and head to Canyoning & Rappelling Tours and River Rafting & Tubing. 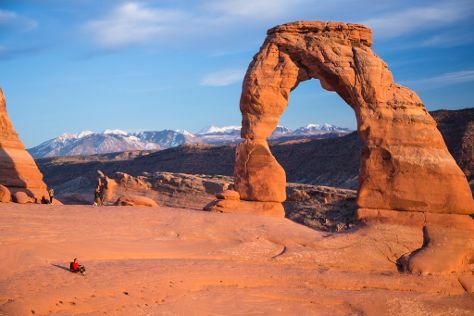 Take a break from Moab with a short trip to Delicate Arch in Arches National Park, about 38 minutes away. Make the 10th (Fri) an unforgettable day with an extreme tour. On the 8th (Wed), dedicate a day to the elevated beauty of Arches National Park. There's still lots to do: stroll through Turret Arch. To see traveler tips, reviews, and tourist information, you can read our Moab trip itinerary app . Traveling by combination of bus, flight, and car from Las Cruces to Moab takes 9 hours. Alternatively, you can do a combination of bus and flight; or drive. When traveling from Las Cruces in May, plan for slightly colder days in Moab, with highs around 76°F, while nights are about the same with lows around 49°F. Wrap up your sightseeing by early afternoon on the 11th (Sat) to allow time for travel back home.